Will add trace minerals to your purified water such as calcium, iron, magnesium, potassium, and zinc. This absorption of minerals from stones recreates the natural effect of the rocks that line fresh mountain streams, creating delicious, fresh tasting water. May raise your water’s pH by approximately 1 ~ 1.5 , for example from 7 (neutral) up to 8 ~ 8.5, perfect for everyday consumption. 700 grams (1.5 pounds), lifespan of 2 years. Very easy maintenance, simply boil and rinse the stones initially before use, and then every three months. One package of stones are intended to be immersed in approximately 8-9 liters of purified water, perfect for a Berkey Light, Big or Royal Berkey. If using in a Travel Berkey, immerse about half of one box. If using in an Imperial or Crown Berkey, use 2 boxes. Also great to immerse in the bottom of your favourite glass pitcher or etched glass jug. I ordered the alkalizing mineral stones from Conscious Water a couple weeks ago. They have been incredibly effective in correcting the pH of our water – from approximately 6.3 to 8!!! We are very pleased with the results. Besides the success we have had with the alkalizing stones, Scott has been so helpful answering any questions that I have had. He is very knowledgeable of the products and has provided fantastic customer service! Toronto city water is generally acidic. This product has helped to improve it and get it more towards the alkaline side, but additionally will add mineral to the water that may be removed during filtering. I am happy with the results I have achieved from this product as well as with the service I received before buying it and the super fast shipping. We’ve had the mineralizing stones in our water supply for around 6 months now. We feel no need to test the ph, as you can really taste the difference. This product was a cost-effective solution to our concerns about alkaline water, that also just logically makes a lot more sense than things like Kangen (which are expensive and marekted in a way that it is way to easy to be skeptical about). We love the water this produces and are thinking of ordering another box for a second filter my wife uses in her studio from aqua ovo, as the water is not nearly as good as the berkee/stone combination. We love this product. I am super happy about the alkalizing mineral stones. It has successfully raised the pH of our water. Much cheaper than Kangen water and a lot easier than going to buy alkalized water somewhere. These stones are very cost effective, and the water tastes great. I was already happy about their ability to naturally raise the pH in our water, and I later found out about the fact that they also add minerals to the water, so it really is a double blessing! Finding out recently about the importance of absorbable calcium in the diet, and this is just one more way to get it. Thank you again Conscious Water! We’ve been using our Naturally Alkalizing Mineral Stones now for about a year. We love the taste of the alkalized water, and the fact that it is adding valuable minerals into our water is great as well! I must also agree with Cliff (above) Scott was very helpful when we were looking into purchasing the mineral stones. Thank you!!! Have been using the mineral stones since Feb 2012 and really enjoy the taste difference. Also have noticed that we don’t get sick as often and when we start getting sick we increase our water intake and we wake up feeling just fine. Over the years I’ve tested my pH balance and have discovered that when I’ve gotten sick is when my pH Balance was below 6.8. Getting these rocks in our drinking water has helped to keep us well, of that I have no doubt. Thanks for a great product. We have been using the Naturally Alkalizing Mineral Stones right from the time we got our Berkey. I appreciated Scott showing us the difference with and without the mineral stones. Very grateful to his knowledge of the products he stands behind. I learned that distilled water was actually acidic . The water we drink now is much healthier and tastes great! We put them in the bottom of our Berkey, great taste….enjoy it much than city tap water. We became aware of the health risks of drinking acidic water. Treated water from the tap has all the minerals cooked with chlorine and is in fact not healthy. The mineral stones have changed the taste of our water and we are reassured that our systems are being alkalized and look forward to the health benefits. Originally, I was disappointed when I heard that Berkey water systems did not generate Alkaline water through the filter process. When I realized that the alkalizing mineral stones were available, going with a Berkey water system was a no brainer. There are so many health benefits to drinking alkaline water. My wife and I have been drinking Alkaline water for some time, and it is amazing how tasty it is and how good I feel. Now, with the Berkey water system and alkaline mineral stones, drinking water is a treat. 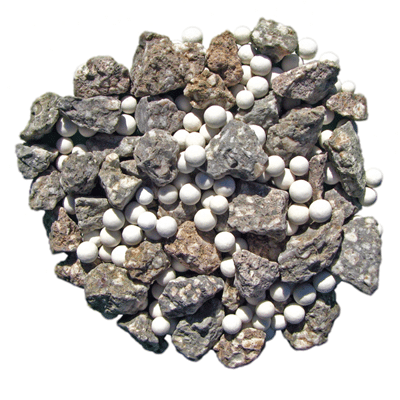 The Naturally Alkalizing Mineral Stones are a wonderful, inexpensive effective way to have alkalized water available in our home. We are extremely happy with our Berkey and the Alkalizing Stones and I love when people come over and say, “Wow how do you get such great tasting water? !” I love to share our story of our Berkey and the stones. Great product with excellent customer service! We just bought the Berkey and a box of Mineralizing stones and are VERY happy with the results – already feeling more energy too. This year I found a need to add minerals/alkalinity for health reasons, I haven’t been absorbing all the very expensive minerals I’ve been buying so looked at all the options out there – expensive and questionable marketing………..we were going to get a Santevia just for alkalizing – but Conscious Water came up in our search and has such a great comparison chart for overall price with less filter change etc with the Berkey and showed how we can filter our creek water AND add alkalinity for way less hassle and money than we thought. Scott’s customer service, honesty, extra tips and fast shipping put him ahead of all others out there. We found the taste still sparkling pure and then we found the Ph had gone from 7.7 to 8.7 immediately! Thank-you for a very good experience!! We would recommend this to anyone. We purchased our mineralizing stones after chatting with Scott at Barrie’s 2012 Eco-Fest. He was very helpful and knowledgable. The online purchasing was very convenient and easy to use. We have been very happy with the quality of our drinking water and have recommended both the mineral stones and Conscious Water to family and friends. Scott recommended that we purchase these stones to go with our Royal Berkey system and we are thrilled with the quality of water they generate. I’m very concerned about the lack of minerals – especially magnesium available in our industrialized food and water supplies and am glad to know that my family is now drinking water similar to what humans have for millions of years and the way our bodies are evolved to expect it. I used to do a lot of whitewater paddling in pristine mountain streams, I’d forgotten the taste of clean mountain water until now. So many things in our environment are acidifying, what a tasty way to fight back. The Berkey filtered water tastes even more delicious with alkalizing mineral stones added to it! They improve my health while also looking lovely in the bottom of a glass pitcher. These stones were back ordered, but Scott provided great service and kept me updated! Scott is the Best! ..so informative and available!!! These stones are the perfect extra to my Berkey! Now I know the ph is is in the alkaline range. I’m so grateful for Conscious Water making these available!!! They are tasteless and make my water alkaline. I put them in water bottles to have it on the go! I was impressed by the quick and knowledgeable responses I received to my email questions concerning the water filtration products. Thank you for sending the items so promptly. The package arrived yesterday. Thank you for also for the chocolate! Just had to let you know- we LOVE our Big Berkey. It took a couple of days to get up the courage to actually put it together but in the end it was no big deal. I was a bit concerned that it was too small for us but it is perfect. We go through quite a bit of water a day as we use it for drinking and cooking but we always have lots on hand. The taste is great and I love that it is definitely more alkaline than our distilled water was. The one big adjustment was in making tea with it. For some reason it makes the tea incredibly strong – too strong for us- but we have found if we pull the tea bag out of the pot after 5 minutes exactly we get a great cuppa (and we do love our tea!). Thanks for the great website and great service. Well I have to say that after taking some Berkey water over to my mother and sister’s house, they were both instantly hooked. My mother insisted on pouring a little into each of our water glasses and having a little “toast” before trying it … very cute, but really it’s a water worth toasting. It’s pure and clear and wonderful… It’s absolutely refreshing and a treat to drink, knowing what is NOT in the water. P.S. Someone wrote in pencil on the invoice “Enjoy your conscious Water Pat :)” I have to say it was a heart-warming little note, simply because I now feel like we are part of the “Berkey family” … a “real” person was on the other end wishing us well. I ordered a Royal Berkey in May 2013, and I have to say that my wife and I absolutely love it. We have been using the stones as well as the arsenic and fluoride filters since the beginning and it has honestly been the best investment I have ever made! (We don’t use tap water for anything but dishes) The stones work remarkably well and the water is so tasty, we get compliments from guests on it all the time. We just cleaned the elements for the first time since May ( the flow rate was going down quite alot) and was amazed and shocked to see the nasty black sludge that was covering the outside of the elements. (really works well) A light scrub with a toothbrush and a rinse and it was 100%. I had also installed a chlorine filter in the shower and man….what a difference! All i have to say is that we are very grateful for you, your team and your company! I recommend you to everyone and will absolutely be doing business again!